FloraSMART is a blend of probiotics (lactic bacteria) which is formulated to provide ‘friendly bacteria’ to the intestinal tract and colon. 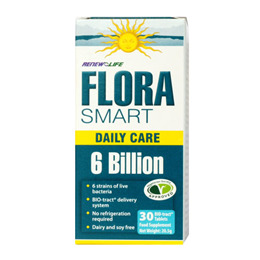 FloraSMART is different from all other probiotics on the market in that it uses an advanced ‘oral controlled’ release technology known as Bio-Tract™. This Bio-Tract™ delivery technology protects the probiotics through the harsh environment of the stomach and delivers them into the intestinal tract where they can be utilized. This coating protects the FloraSMART from light and heat so that it does not require refrigeration. Lactobacillus acidophilus (Nx5864), Bifidobacterium Bifidum (Nx5857), Bifodobacterium longum (Nx5846), Lactobacillus casei (Nx5858), Lactobacillus rhamnosus (Nx5839), Lactobacillus salivarius (Nx5863), Bio-Tract Coating Ingredients (microcrystalline cellulose, hydroxypropylmethylcellulose, pectin, sodium bicarbonate, sodium carbonate, silicon dioxide [mineral source], stearic acid, turmeric). Take 1 tablet per day 2 hours after food. If currently taking antibiotics, take at least 2 hours after taking antiobiotics. Do not crush or chew. Below are reviews of Renew Life FloraSMART Daily Care - 30 Tablets by bodykind customers. If you have tried this product we'd love to hear what you think so please leave a review.